The Galway senior hurlers brought their fans on a rollercoaster ride in Semple Stadium when they defeated Kilkenny by 1-28 to 3-15 and won the Bob O'Keefe Cup to be crowned Leinster champions for a third time. 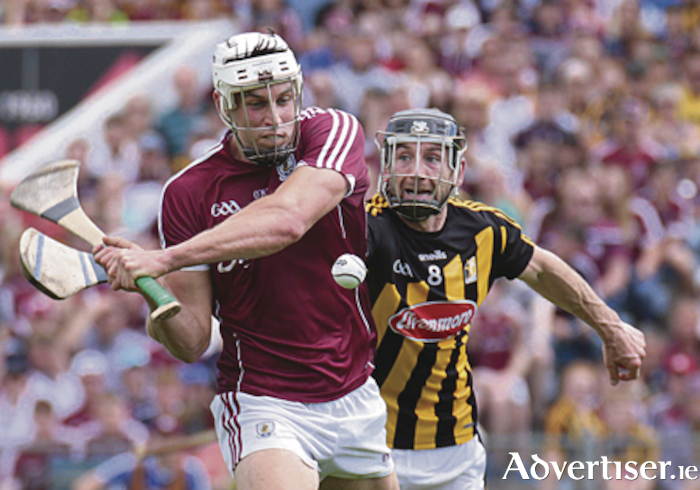 Galway were out of the traps like ravenous hounds on Sunday, and with Johnny Glynn selected ahead of Conor Cooney at full-forward, the Ardrahan man's aerial prowess caused turmoil in the Kilkenny full-back line. The favourites for the 2018 All-Ireland title raced into a big lead, with Glynn striking a good goal to give Micheál Donoghue's troops a tonic start. The Galway players upped their work-rate and intensity enormously all over the field from the drawn game, with team captain David Burke and Johnny Coen far more influential around the middle than they had been in Croke Park. Joe Canning was more productive too, and his work-rate, free taking and point taking from play were back to their sublime best. The Portumna man's two points in the first half were sublime, and the way he controlled the sliotar, which came to him high and at speed, was beautiful to watch. The Galway forwards, led by Cathal Mannion with six sweet points from play and Conor Whelan with 0-4, were far too hot to handle for the Kilkenny defenders. Wing-back Aidan Harte also chipped in with two terrific points from distance, and there was no real comparison with the display last Sunday in Thurles and the lacklustre performance in Dublin. John Hanbury was imperious in the full-back line and cleared a lot of ball, with Daithí Burke and McInerney solid in the middle. Obviously the players decided in the intervening week that what they had produced the first day was not good enough, but manager Micheál Donoghue denied the first game was a wake-up call for his team. “I’ve said it many times, this group doesn’t care what is being said outside of the group. We can’t control that, we just try to control what happens in Athenry when we’re training. After 33 minutes Galway were leading by 12 points, 1-15 to 0-6, and the game looked dead and buried. However Kilkenny's Ger Aylward, who took a phenomenal number of steps - 12 at a minimum - struck a very soft goal, helped by a bizarre dive out of the way by James Skehill. No doubt the 6' 5" Cappie clubman will have received a fair bit of slagging this week from his teammates for his feet first approach to stopping the Kilkenny man - and with the fillip of that goal, the Cats were back in the game and were only nine behind at half-time, 1-16 to 1-07. Kilkenny rallied in the second half too, and helped by two opportunist goals, they brought the game back to a one point ball game at 1-20 to 3-13. Galway supporters were worried at that stage, but Joe Canning showed tremendous leadership and belief to cut through the Kilkenny defence to lash over a super score that ensured Galway were in the ascendancy again. Man of the match Cathal Mannion also struck two more points, and the black and amber rebellion was repelled and then quelled with further scores from Conor Cooney, Aiden Harte, Canning again and Jason Flynn, ensuring Galway won with seven points to spare at the finish. Galway's work-rate was top class last weekend and they really set down a marker for the other teams and showed real character when it was needed. The forwards were selfless in the way they threw the ball around with a great pass out from Flynn to Canning for a late point an example of that. For now, it is back to training and hard work in Athenry and the management team can analyise the two quarter-finals this weekend and see what they can learn about their semi-final opponents. With the U21 win over Wexford and the U17s starting their campaign off with a win too, it was a really positive week for Galway hurling, a point acknowledged by the senior manager. “It’s going really well for us. It was a brilliant week for Galway hurling with the U21s winning during the week as well. There was a massive connectivity with that group, so it’s been a good week," says Donoghue. “There are areas we need to improve on, so we’ll just get back to the training ground and push again. We’re just happy now to move forward and work really hard for the next three weeks."